I passed this lovely long legged creature while I was walking in Boundary Creek Park in Moorestown, New Jersey. Click on the photo to enlarge it. Years ago I would have thought it was a tremendously big spider; it was about 4 or 5 inches from leg tip to leg tip. But it's not a spider. 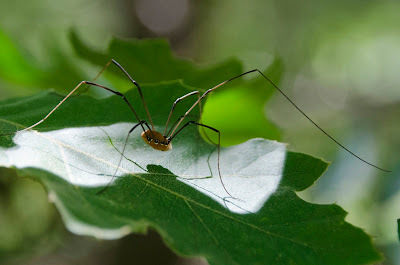 It is a member of the large arachnid order Opiliones, usually called by the common names of harvestman or harvester, daddy-longlegs or granddaddy-longlegs. The opilionids don't spin silk and don't make webs. They don't make venom. Their bodies are not divided into 2 segments with a "waist" like spiders. Many but not all of the thousands of described species of harvestmen have these extremely long slender legs. I always find them like this, sitting motionless upon leaves, possibly waiting for unsuspecting prey like an aphid, mite, caterpillar, or whatnot to stroll past, but maybe just taking in the summer day. 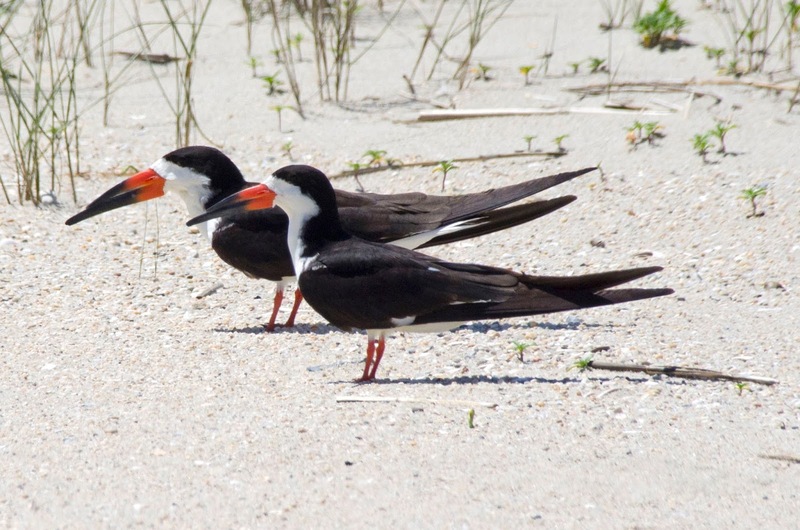 Shorebird identification can be challenging for new bird watchers. 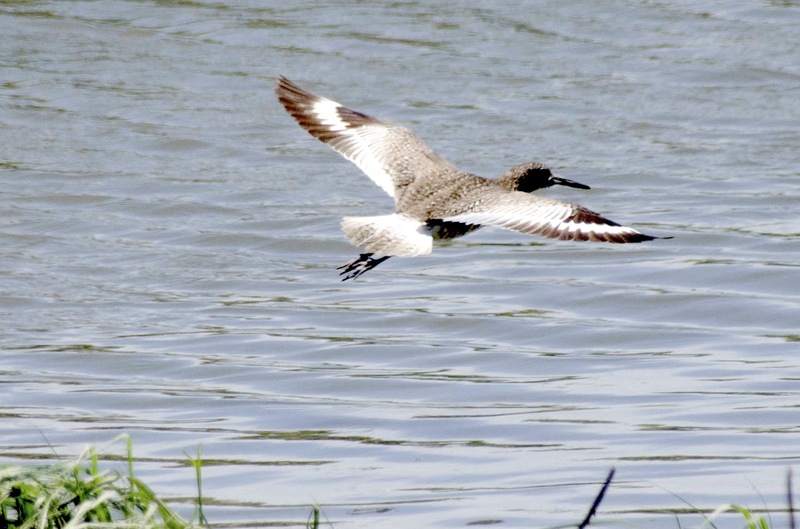 But one of the shorebirds, the long-legged pigeon-sized willet, Tringa semipalmata, helps out by obligingly shouting its name "Pill Will Willet! Pill Will Willet!" and then spreading its wings to reveal white markings that differentiate it from all others. 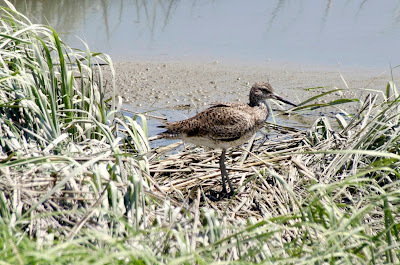 I cannot tell you how many times I've asked "Is that a willet?" to have the question answered by the bird itself with a call and a wing flash. Click to enlarge. The willet is my pick for a father's day bird because, according to the Cornell Lab of Ornithology, although both willet parents share the task of incubating eggs, only male willets spend their nights on the nest. Happy Father's Day to everybody! I was walking in Long Bridge Park in Burlington County, New Jersey, the other day. There are lots of wooden walkways over marshy spots on the trails. Whenever I walk on nature trail boardwalks like that I scan the handrails because they are good places to find insects basking in the sun and caterpillars that have fallen from trees. I was not disappointed. Stopping to investigate a tiny fly I saw the critter pictured above -- a peacock fly with its wings raised over its back, from which it gets its common name. Click to enlarge. 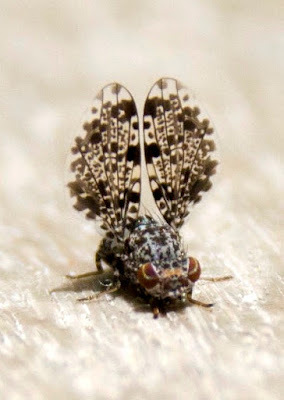 The peacock fly is more formally Callopistromyia annulipes of the picture-winged fly family Ulidiidae. 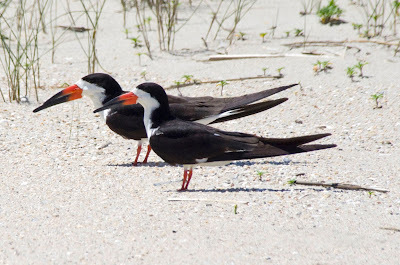 They are found across North America. 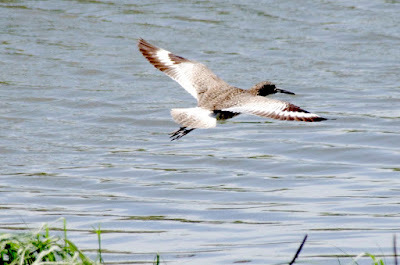 Both genders commonly strut with their wings up like this and several other individuals were near this one. 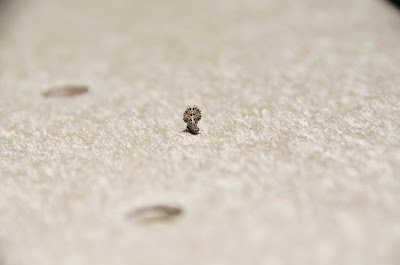 Being only about the size of fruit flies they are easy to overlook and I had never seen one before. 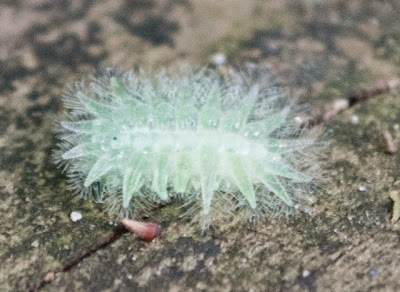 This all reminds me of the last spectacular thing I found on the handrail of a nature trail: the rarely seen holy grail of caterpillars, a spun glass caterpillar, Isochaetes beutenmueller. It was on a wooden railing near the River Styx in Mammoth Cave Park in Mammoth Cave, Kentucky. Sometimes it pays to keep your eyes down.